Hi Paul, is there an advantage to one method over the other? Fyi bass in question is an LB-100. jim.i wrote: Hi Paul, is there an advantage to one method over the other? Fyi bass in question is an LB-100. The copper, if done well and leaving no gaps, should be a little better at rejecting noise. You can solder to the stuff, which is great when tying everything together. It's also pretty to look at. Paint, OTOH, is easier to apply and a couple coats is plenty effective at rejecting noise. In a production environment, such as a guitar factory, paint makes a good deal more sense. It can be applied in just a few minutes and gets the job done. Plus, its per-instrument cost is going to be considerably lower than foil due to the reduced time on-task. In the hands of a player tech-ing around foil will probably get the nod. I agree with Ken. I have shielded countless instruments in my life and here’s what I’ve learned through the years. First off, if done properly, both ways will work great and shield out external noises with no problem. 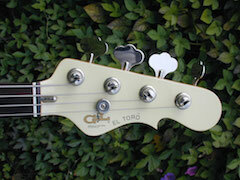 It’s really about what the control cavity looks like on the bass you’re trying to shield. If the cavity has been painted and has a gloss finish on it, trying to paint over it with graphite can be a real drag. The paint has a hard time sticking to the wall of the cavity, and when dry, can rub off on you or components in the cavity. Here’s my thoughts on the matter. I use graphite paint when the cavity is not painted at all and pretty clean inside. I then screw a small ground lug into the side wall of the cavity and solder a hook up wire to it. Then I paint a coat of graphite paint over the ground lug and the entire cavity. After that dries I then put on a second coat. After that dries, I paint the cavity with clear lacquer, poly or any type of covering. This is to keep the graphite from getting all over anything it comes in contact with. The wire from the ground lug will solder to the back of the pots and become your system ground. If the cavity has been painted like the rest of the bass, I clean the cavity out real good with Naptha or a good rubbing alcohol and then start applying the copper tape. I overlap the tape edges about 1/16 of an inch and I put at least one small solder connection between each piece of tape ( I have had way too many tape failures happen when the adhesive on the back of tape gives way and loses contact ). This gives a great looking and well shielded cavity. Now, this is just what I do. There are other people that have their way of doing it so I don’t want to sound like if you don’t do it my way you’ll have a problem. Hopefully we’ll get a few other people sharing their techniques. Wow, this is a really long answer to you question. Sorry, I do ramble on from time to time. Paul this is no ramble, it is great info. Likewise Ken's comments. I haven't pulled the pickguard yet (LB-100) so don't know what i'll find in the cavity but now i can use either method of shielding. Thank you both, hope your holiday is safe and sane. Oh, one other question - do you shield the pickup cavity and cable channel (if there is one) as well? jim.i wrote: Oh, one other question - do you shield the pickup cavity and cable channel (if there is one) as well? I will generally shield everything. One thing to consider: Fully shielding the bass will tend to darken the tone just a smidge. I'm not smart enough to know the why of it (Paul is! ), but it's something I noticed on the SB-2 above. I generally shield both the control and pickup cavities. Like Ken mentioned, sometimes the bass can sound a bit darker after the shielding job. Here’s why. Fully shielding a Control and Pickup cavity does increase the system capacitance. Although by a very small amount. This will measurably lower the resonant frequency of the pickups. I say measurably because I can always measure it, but, often times I can’t personally hear it. Too many years in front of 100 watt Marshall amps. Some instruments are affected by additional capacitance more than others but I feel it’s very important to have a well shielded bass. Bottom line? I have a treble control on my amp to bring back small high frequency loss. I’m not aware of a control on any amp that rids me of the irritation of noise and hum from a poorly shielded instrument.